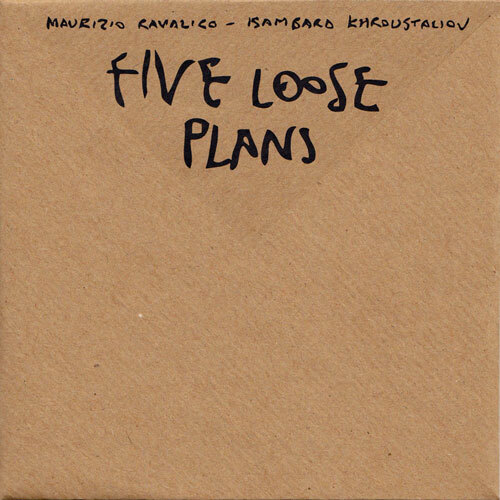 This recording is a document of the first meeting between Maurizio Ravalico and Isambard Khroustaliov; an exploration into the sonic potential of metric freed percussion and real-time electronics in the context of free improvisation. The duo take advantage of acoustic sound at its richest and most varied in terms of timbral expression with Maurizio’s set-up expanding the palette of percussion sound from a selection of normal instruments (two surdos, Tibetan bowls and cymbals) into the open-ended realm of found objects, employing various kitchen utensils, marbles, film tapes, magnolia leaves, and different components from industrial machines. Isambard’s sound construction runs in parallel to this real-world scenario and is on this occasion, non-generative. He picks up the sound created by the acoustic instruments, analyses and processes it in real time (using a series of hand crafted software tools) and plays it back to Maurizio as a mode of conversation, creating a structural dialogue between two vastly different worlds, one continuous by its very nature and the other a discreet manipulation of this reality. The duo’s approach to the music itself is therefore predominantly concrete, in that the two performers work at generating one single and undivided sound output. No one is accompanying anybody else; both performers occupy the same sound zone, and are, under all perspectives, playing one single four handed meta-instrument. The CD comes in a specially designed fold-out package made from one sheet of paper, with hand printed artwork. Isambard Khroustaliov / Maurizio Ravalico Duo – Improvisation 1 from not applicable on Vimeo. Isambard Khroustaliov / Maurizio Ravalico Duo – Improvisation 2 from not applicable on Vimeo.